If you are planning to take your exams on a computer, you need to download and install Examplify – the software used for taking secured exams. We ask that you please take action next week. Beginning Monday, November 19, 2018, you should download Examplify and your exam files. To download Examplify, please go to the Examsoft website at examsoft.com/templelaw. Log in and follow the instructions. Your Student ID (under Exam takers) is your 9-digit TUID (found on your Temple ID card), and your password is the first letter of your first name + the first letter of your last name + the last 4 digits of your Student ID. Both letters are capitalized. (Example: Jane Doe 123456789 will be JD6789). Once you have downloaded the software and installed it, you may elect to take any or all of your scheduled free-slot exams on your computer. Your exams are available under My Exams. If you experience any difficulty downloading Exam Files or Examplify, please email lawexams@temple.edu as soon as possible. If you have non-technical questions or concerns, please contact jennifer.bretschneider@temple.edu. NCBE will begin transitioning the MRPE from a paper-based to a computer-based delivery platform in August 2019. An announcement sharing a more detailed transition schedule was posted on our website today; you can read the announcement here. The ABA’s Business Law Section is now accepting applications for its Diversity Clerkship Program, a summer program that provides business law clerkship placements for qualified diverse first or second year law students. Participating clerks receive support and mentoring in the business law field and exposure to business practices. Roles and responsibilities of selected participants include researching cases, drafting memoranda and opinions, observing trials, and networking with local attorneys and judges. Participants receive a $3,000 stipend. Applications are due January 7, 2019. The Sarita and Claire Wright Lucas Foundation Scholarship is a competitive scholarship program that makes annual monetary awards to qualified, outstanding graduating African-American female law students. Scholarships recipients are eligible to receive two separate categories of monetary awards (bar application and preparation and employment incentive) for a total of $10,000. Interested students can review the eligibility criteria, program description, and apply here by February 16, 2019. Mindful Mondays continue every noon in K5B until Monday December 3rd. Plan to attend! Spring 2019 State Court Honors Internship Program (3 credits) – 2L Day and 3LE Apply Now! ACE Counselors will be holding sessions on exam techniques specific to your Section. Plan to attend! Campus police will be at the Law School on November 27th from 4-6 p.m. in the 2nd Floor Klein Hall lobby. Please come and register your bike with Temple Police. Registering your bike will facilitate return if your bike is found. Registration is free and everyone who registers will also receive a free Kryptonite lock. To register please go to registermybike.temple.edu to compete the on-line registration process and then bring your bike to school during the time listed above. Coffee and donuts will also be provided. Questions? Email britt.walden@temple.edu. Join Professor Green, Dean Lennon and Kristen Davis, of Career Services, on November 20th, from 4:00-5:00 in K1C for an informative discussion on postgraduate judicial clerkships. The session will cover the benefits of a clerkship as well as the application process for both federal and state clerkships. Questions? Email lcareer@temple.edu. Spring 2019 State Court Honors Internship Program (3 credits) – Application is now open! We are proud to offer the State Court Honors Internship Program (SCHIP). In this three (3) credit experiential program, second year day and third year evening/part-time students are offered an opportunity to work for a judge in the First Judicial District of the Court of Common Pleas of the Commonwealth of Pennsylvania. Students are educated on the structure, function, administration, and diversity of issues presented in the state judiciary, and gain practical experience with the various divisions in the First Judicial District. Working with the judges and their full-time clerks, students draft orders, research issues, prepare bench memoranda, and observe judicial proceedings. Further program information, including the application and the selection procedure, can be found here. Community Reminder: Wednesday, November 21 will follow a Friday class schedule. Please remember that during the week of Thanksgiving, Wednesday, November 21 will follow a Friday class schedule. Unfortunately, this Saturday’s run/walk has been cancelled. Thank you to everyone for their participation and enthusiasm this semester. We look forward to seeing you in the Spring. Questions, concerns, or comments? Please let us know by emailing britt.walden@temple.edu. Be Healthy. Be Balanced. Be Well. Applications for Spring 2019 School Designed Practicum Courses are open. New opportunities have been added so be sure to periodically check the listings. Application information can be found here. Questions? Contact Mai Le at mai.le@temple.edu. Wellness Walk/Run – Final Event in 2018 – November 17 – Please join us! Monday, November 11th is Veterans Day and we want to take this opportunity to recognize all of our Veterans, wish you a Happy Veterans Day, and thank you for your service. The Community Lawyering Clinic has a few remaining slots. In this 3 credit internal clinic students will work on real cases in landlord/tenant court, mortgage diversion court, and public aid hearings; advise on employment issues; and advocate for clients in many other settings. Learn more about the clinic here. Interested students should email jennifer.bretschneider@temple.edu ASAP (or register on Banner). 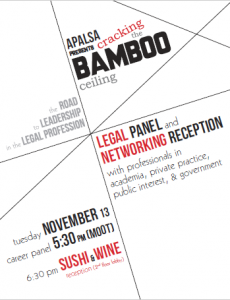 APALSA presents “Cracking the Bamboo Ceiling” on November 13th in the Moot Court Room at 5:30 p.m. Please plan to attend this wonderful event. Community Legal Services, Philadelphia Legal Assistance, the Homeless Advocacy Project, AIDS Law Project of Pennsylvania, and Philadelphia VIP invite you to their Law Student Open House on Thursday, November 15 – 4-6 p.m. at 1424 Chestnut Street, Philadelphia, PA.
On November 13 at 12 pm in K1E for day students, and November 14th at 5:30 pm in K2B for evening students, Prof. Shellenberger and Mai Le will discuss strategies for tackling exams. Food will be provided. Questions? Contact Mai Le at mai.le@temple.edu. Haverford College is in need of judges for their Mock Trial Competition. There are two rounds each day of the tournament, making four in total. If you are interested in judging, please complete this form. Community Reminder – Day Light Savings Time – November 4th – Mark your calendars! SPIN’S Fall Forum – November 6 – Save the Date! “Police Use of Deadly Force: Through the Lens of Sport Psychology” – Presentation by Dr. John Heil 11/8/18 – Save the Date! 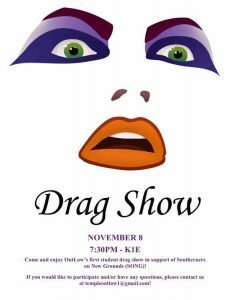 Please mark your calendars for OutLaw’s 1st Student Drag Show on November 8th at 7:30PM in K1E. We hope you will attend this wonderful event – proceeds will support SONG (Southerners on New Ground). All exam conflict forms are due Monday, November 5th. You can fill out the form here and email it to Ms. Kathy Wilson at kilson@temple.edu. Questions? Please email jennifer.bretschneider@temple.edu. Exam information sessions will be held on on 11/6/18 K2B and 11/7/18 K2B at noon. We will cover important information like: what to expect when you take a law school exam, the exam procedure, software needed, what you can bring into an exam and more. Please bring any questions and concerns. We look forward to seeing you there. Questions? Please email jennifer.bretschneider@temple.edu. Ms. Laurie Besden, Esquire, Deputy Executive Director of Lawyers Concerned for Lawyers (LCL) will be in Klein 519 from 11:30 am to 2:30 pm on November 5th for a “closed door” assistance. Student can meet with Laurie to talk confidentially about addiction, alcohol issues, mental health disorders, gambling, stress, depression or ethical and bar related questions related to any of these issues. This is an opportunity to receive help and we encourage you to stop in to meet Laurie. As always, LCL is also available at any other time. To reach LCL please call 1-888-999-1941. Please note that Laurie does not share any information with faculty or administration – this is completely confidential. Don’t forget to change your clocks on November 4th! We regret to inform you that three of our four in-house clinics (the Elderly Law Project, the Family Law Litigation Clinic, and the Sheller Center Social Justice Lawyering Clinic) are fully enrolled for the spring. There is still space to register for the Community Lawyering Clinic, and you can do so through the normal course registration process; please contact Professor Rand at spencer.rand@temple.edu with questions about that clinic. If you are interested in the Family Law Litigation Clinic, Prof. Katz is maintaining a waitlist; you can email her directly at katzs@temple.edu. For those of you who were hoping to register for one of the fully enrolled clinics for spring 2019, we wanted to apologize and explain. In the spring of 2018, we piloted a new approach to in-house clinic registration, where students completed an application to be selected to enroll in clinics for Fall 2018 and for priority enrollment for Spring 2019 (rather than limiting clinical registration to once a year). We were surprised to find that students filled the spring 2019 clinics during the spring 2018 application process. We have learned from this pilot; in the 2019-20 academic year, we will allow students to apply for clinics the following semester only, which will ensure that students will be able to apply to all of the in-house clinics each semester. Thank you for your patience as we figure out the most effective and student-friendly approach to clinical registration. Please contact Associate Dean Jaya Ramji-Nogales with any questions (jayarn@temple.edu). Please mark your calendars for SPIN’s Fall Forum “Cracks in the Justice System: Wrongful Convictions and Institutional Reform”. This wonderful event will be held on November 6th, from 5:30-7PM with a reception following. Please join Kristen Davis and Jorge Godoy, of the Office of Career Services, for a presentation on the nuts and bolts of the PIPS Career Fair. You will learn about the fair, as well as the application process and upcoming deadlines. November 5, 2018, 12:00-1:00pm, K2A. Questions? Email lcareer@temple.edu. Please join Kristen Davis and Committee of 51, for a Resume Workshop on November 7, 2018, 5:15-6:00pm, K1C. We will be reviewing the basics of a legal resume and working on revising your existing resume at the end of the workshop. Please bring your laptop, with a copy of your resume on it. You can register now on the CPM. Questions? Email lcareer@temple.edu. All students should be aware of the importance of determining the applicable character, fitness, and other requirements for admission to the bar in each jurisdiction in which you intend to seek admission to the bar. It is never to late to start this process. For those students who want important information about 2018/2019 dates and deadlines, the information can be found here. This December, the Pennsylvania Bar Foundation will award up to $12,000 in scholarship assistance to Pennsylvania residents attending the nine accredited law schools serving the state. The James W. Stoudt Memorial Scholarship of the Pennsylvania Bar Foundation provides three, $3,000 scholarships, two of which are specifically dedicated to the support of historically underrepresented minority law students of African-American, Hispanic-American or Native American ancestry. Named after one of the Foundation’s most devoted supporters, the James W. Stoudt Memorial Scholarship is open Pennsylvania residents in their second year of a fulltime law school program or third year of a part-time program. To be eligible, applicants must be or become law student members of the Pennsylvania Bar Association which is free for law students choosing to become electronic members, demonstrate financial need and good academic standing and submit an application that includes: proof of residency; an unofficial copy of a current academic transcript; a maximum of two recommendations; and a 500-word essay that describes how the applicant plans to demonstrate his/her/their potential for making a contribution to society and the legal profession. Please avoid communication with your professors with anything having to do with exams. The Fall 2018 examination schedule is now available here. This Fall, the last day of classes is Wednesday, December 5, 2018. Exams will begin on Friday, December 7, 2018 and end on Thursday, December 20, 2018. Please be aware that the exam period is very compressed and that, under our exam conflict policy, you may be required to take an exam every other day. Information about exam conflicts and the Exam Conflict Form can be found here. If you have a conflict please complete the form at this link and email it to Ms. Kathy Wilson (kilson@temple.edu) in Student Services (Barrack 103) by Monday, November 5, 2018. Hard copies of the schedule are available in the Student Services Office, Barrack Hall, Suite 103. 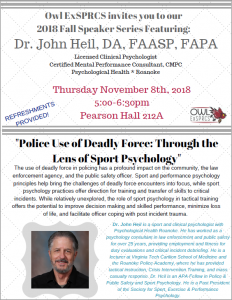 You are invited to attend the lecture by Dr. John Heil, Licensed Clinical Psychologist, “Police Use of Deadly Force: Through the Lens of Sport Psychology” on Thursday, November 8th, 5-6:30 pm in Pearson Hall 212A. November 8, 2018, 8:30-10:45am, Pennsylvania Academy of Fine Arts, Historic Landmark Building, Hamilton Auditorium, 118 N. Broad Street, Philadelphia, PA. The Directors Roundtable Institute invite you to attend a program for board of directors, their advisors and the business community in order to honor Anne Robinson, of the Vanguard Group. There is no fee to attend and continental breakfast will be served. For more information, and to register for this event, visit the Director’s Roundtable website. Questions? Email lcareer@temple.edu. Saturday, November 10, 2018, 9:00 am – 1:00 pm, Fox School of Business, Alter Hall 745. Paul Abrams will provide best practices for public speaking, lead presentation exercises designed to apply new skills, and offer personalized suggestions for improvement. Coffee and bagels will be provided. For more information, and to register for this event, visit the public invite. Questions? Email lcareer@temple.edu.